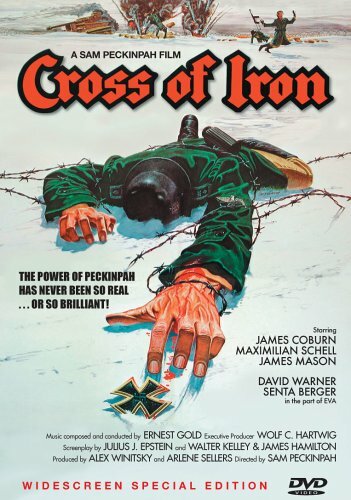 Sam Peckinpah´s only war movie, Cross of Iron, is a UK/German co-production and probably one of the best war movies you can possibly see. It is based loosely on the battle of Krymskaya that took place during the German retreat in 1943. The original source is Willi Heinrich´s Das geduldige Fleisch aka The Willing Flesh. Heinrich fought himself on the Eastern Front. It contains quite a lot of graphic infantry combat scenes. Steiner is one of my top favourite characters, right after Sgt. Elias, however much more cynical but a good man at heart. I have read reviews of this movie that were not favourable and I admit, it could be misunderstood. If you do not pay very close attention and take into account the opening and final credits, you might simply not see the profundity of the anti-war statement. Cross of Iron opens on a cheerful children´s tune Hänschen Klein ging allein, in die weite Welt hinein, Stock und Hut, stehn ihm gut… While we hear this tune we see black and white footage of grim content interspersed with pictures and stills of Hitler Youth to show us the slow ideological infiltration of the German youth. The movie tells us a story from the point of view of a German platoon on the Eastern Front in 1943. At the heart of the story is the antagonism between Sgt. Steiner (James Coburn) a much admired veteran who has already earned two Crosses of Iron and Captain Stransky (Maximilian Schell) an arrogant, conceited Prussian officer whose only goal is to be awarded such a cross. When tensions intensify Stransky does not inform Steiner and his platoon of their retreat and the men are left stranded behind enemy lines. They barely make it back and Stransky let´s his men open fire on them. We get to see a scene that resembles many a Western showdown. This movie wouldn’t be the controversial movie it is if there were not other extremely important elements that have not so much to do with the core story. Steiner has an affair with a nurse (Senta Berger) after being wounded. This scene, that has been criticized, is meant to emphasize his cynicism and, I believe, should be seen paired with the other female roles in this movie, namely the female Russian soldiers Steiner´s troop encounters on the retreat. It is rare that you see female soldiers in war movies unless they are Russian. Running out of men and considering women – due to their assumed patience – to be better snipers Russia recruited a lot of women towards the end of the war. There are a few Russian movies dedicated solely to female soldiers (I will review them in due time). But let’s get back to Cross of Iron. The encounter of those female soldiers and Steiner´s men gives us one of the most graphic scenes I have ever seen in a war movie. Not for the fainthearted. All in all, apart from the central story of hatred between two men from different social classes, the movie is complex and composite. It certainly gains by being watched twice. The actors are all very good. James Coburn is fantastic. Maximilian Schell is very good and so are James Mason, David Warner and Senta Berger. What I liked a lot is how daring Cross of Iron is. It does not shy away from touching topics that are normally left out, it goes beyond what we are used to see and stays in your mind long after you watched it. Cross of Iron is among my Top 20, that is for sure. This entry was posted in Eastern Front, Infantry Combat, Reviews, Trailer, War Movie, Women in War Movies, WWII and tagged Cross of Iron, David Warner, Female Russian Soldiers, Female Soldiers in War Movies, Infantry Combat, James Coburn, James Mason, Maximilian Schell, Movie Trailer, Movies, Nurses in War Movies, Reviews, Sam Peckinpah, Senta Berger, Steiner- Das eiserne Kreuz, War Movies, Willi Heinrich, Women in War Movies, WWII, WWII Eastern Front. Great movie. It is #64 on the Military History list and should be higher. I will be surprised if I don’t find it is superior to many of the older “classics” than are higher ranked. I also read the book which is equally good. I too am fond of the Steiner character, but also loved David Warner in it. I feel it would be more highly thought of if it was an American unit. There are critics who refuse to like movies sympathetic toward the German soldier’s experience. That would actually mean that no war movie taking place on the Eastern Front would be appreciated by Americans? Stalingrad is generally rated very high even though we have the German perspective. I think Cross of Iron can make you uneasy for various reasons. Gary Freitas did not get it. He writes in his review that we have to wait until the last half hour to understand that there is a conflict between two men. Was he sleeping during the beginning? It is outstanding. I think the relationship between Mason and Warner’s characters are interesting too but I had to cut my review somewhere. “Stalingrad” is ranked #23 by MH. That is major props. I have a DVD copy, but am refraining from watching it until I get to it on the list. It is very difficult to wait. I can’t wait to compare it to “Enemy at the Gates” and “Cross of Iron”. I start to believe that Stalingrad is my all time favourite. I thought I preferred Black Hawk Down but, no, I think it is Stalingrad. I definitely think it is the best out of the three. It is so unambiguous. Good to see you review this, I was reading some war movie reviews over at Amazon concerning another movie ‘cerca 1980’ and the reviewer recommended this movie instead which came out a few years before. It is really good but I think not as widely known as it should be. Maybe also because people think it odd Peckinpah did it. I still think Stalingrad is better, but it is very good and different from many others. Tell me what you think of it, once you have seen it. The unit responsible for the hanings was the 707th Infantry Division, the German Army unit most implicated in war crimes and crimes against humanity. It was used for rear-area fighting against partisans, as well as actions against Jews. The commander, Generalmajor Gustav Freiherr von Mauchenheim, was an ardent Nazi and anti-Semite. Sophie Scholl was beheaded by guillotine, BTW. Anyway, off to browse more – thanks for making this blog! Thanks also for the comment. I’ll have to edit it later. I’m always grateful for valuable info. It took a while but I finally managed to correct it. Thanks again. your posts are very good. I am myself very much fascinated by the Eastern front. There is a mystique to it that you cannot explain. Recent studies led by my fascination have revised my outlook towards Germans n the Second World War. I wish we rise our our predefined perceptions constructed by Zionist media and see the war as it was horror on all sides with crimes committed by all sides. Thanks for the kind words, Moshin. I know, I feel the same about the Eastern Front. Ever since I’ve read last letters from Stalingrad, written by German soldiers. Everyone, on every side committed crimes. Have you watched the German movie Stalingrad? It’s one if my favourites.